http://www.somervillepubliclibrary.org/ – Check the Program & Events Calendar! 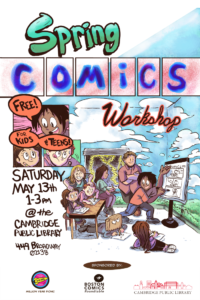 The Somerville Public Library Comix Con is an all-ages celebration of fandom, combining the worlds of film and television, science fiction, fantasy, comic books, graphic novels, anime, books, cartoons, gaming, and collectibles! Cosplay Presentation • Costume Contest • Visit from Imperial Troopers from the 501st Legion • Artists’ Alley with over 30 Local Artists • Board Games with Knight Moves • Superhero Scavenger Hunt • K-pop Trivia & Karaoke • Fandom Photo Ops • Prizes • Free Comic Books • Make-Your-own Magic Wands • Free Food While It Lasts • and more! A detailed schedule will be provided in the near future. This program is free, wheelchair accessible, and funded in part by the Friends of the Somerville Public Library.